Originally produced in Southern France and Northern Italy, Marrons Glacés consist of wonderfully coated and glazed chestnuts. This delicacy requires only the highest quality raw material and the best manufacturing methods. 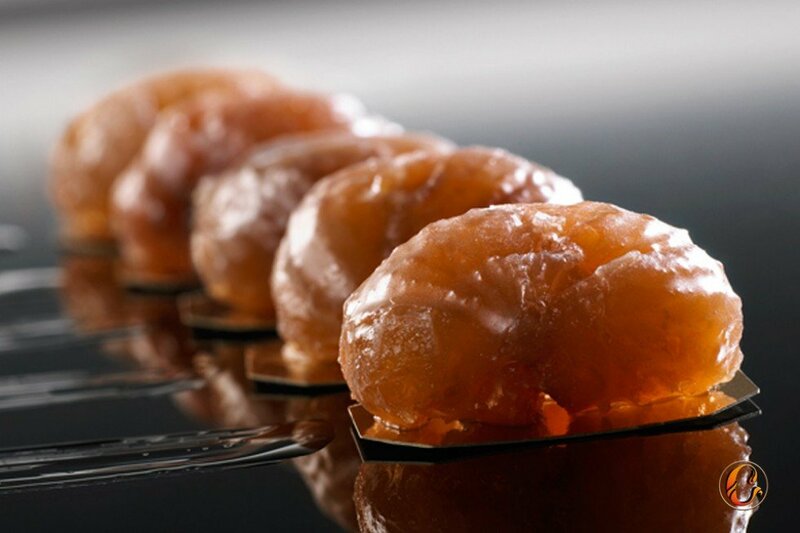 After being peeled through traditional techniques, they are selected and candied for several days in a vanilla-flavoured sugar solution. Therefore, the candied chestnuts are individually checked before being coated with a fine glaze of sugar. The last step consists of a drying process that gives to the product a gleaming and delicious appearance. A rigorous attention is paid in order to obtain the excellence in all of the Marrons Glacés varieties and forms: whole or broken, in tin or gift boxes, in tray or handy wrapped one by one. Marrons Glacés are usually wrapped in beautiful golden foils and packed in unique presentations. Our private label service allows us to customize your orders by creating your ideal packaging solution for your project. Customization is available for large as well as for small orders. Multiple purposes: ready to eat, they taste perfect with tea, coffee, or a good Brandy; as a decoration on desserts; generally used in Pastry. Its luxuriously sweet taste makes it an inimitable product… not just Marrons Glacés but also ingredients based on chestnuts for Food and Confectionery Industry. We are extremely demanding about the quality of the products we offer: from the selection of the raw material to the last step of the production process, we guarantee our Marrons Glacés superior quality. Do you need some more information on Marrons Glacés?